There are two books that represent the holy grails for fans of Ian Fleming. One is Ian Fleming’s account of Kuwait and its oil industry, State of Excitement, which was suppressed by the Kuwait government. The other is what might have been the first continuation Bond novel, Per Fine Ounce, by South African thriller writer Geoffrey Jenkins. The former is under lock and key and is unlikely ever to see the light of day. The latter was rejected by Glidrose Productions and the typescript is lost, except for four heavily-edited pages of an early draft. Geoffrey Jenkins was free to use the material within his rejected novel, so long as all references to Bond and other Fleming characters were removed. It seems that Jenkins never returned to the work, but the book has now inspired author Peter Vollmer produce a version of Per Fine Ounce. In this case, however, the book is a continuation novel not of James Bond, but Jenkins’ own action hero, Geoffrey Peace. As with Jenkins’ typescript, Vollmer’s novel is set in South Africa, though is now in the dying days of the apartheid era. 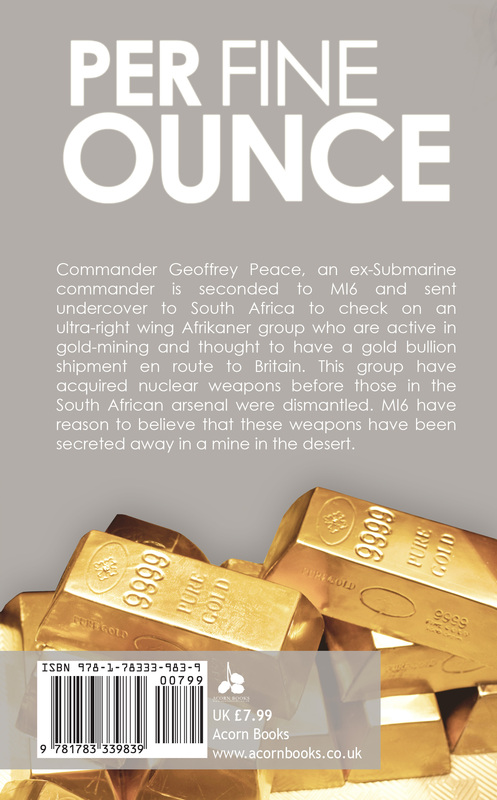 Geoffrey Peace, a former submarine commander and now MI6 officer is ordered by his chief, Vice-Admiral Sir John Whitehead, to investigate South African industrialist Anton VanRyn, a white supremacist who has hoarded a huge stock of gold, which threatens to destabilise global markets. More worrying, he has acquired nuclear weapons and is threatening to use them to halt the rise of Black-majority rule. Geoffrey Peace travels to South Africa in the guise of Lord Digby Brentwood, a wealthy investor with extreme right-wing views, in order to infiltrate VanRyn’s organisation. Peace quickly earns the confidence of VanRyn – and his beautiful daughters, but suspicions about the true identity of Digby Brentwood are never far from the surface. 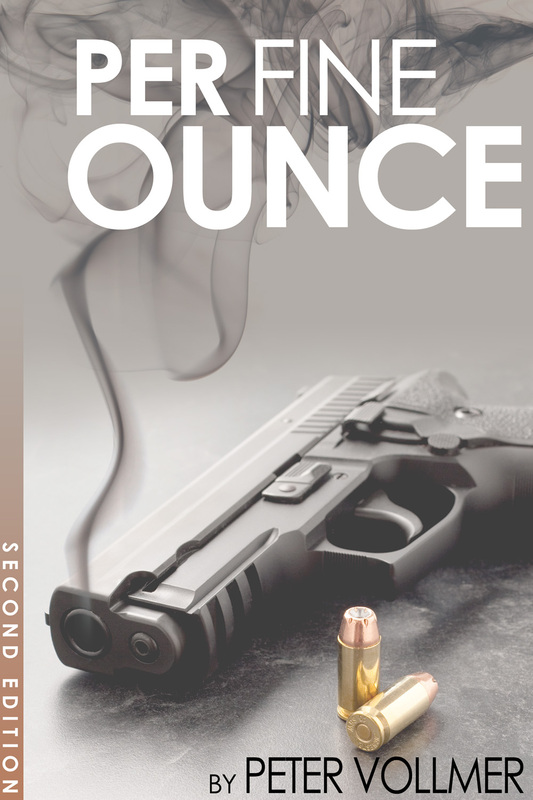 Peace, helped by the beautiful and tough MI6 agent Cherry Boxx, finds himself in a deadly race to destroy the nuclear weapons. Inevitably, given its history, Per Fine Ounce reads like a James Bond novel. The book has the sort of prologue that began some of Fleming’s novels. Geoffrey Peace exchanges flirtatious repartee with the Vice Admiral’s secretary, Jenny Damsby. He is briefed by the Vice Admiral just as Bond is briefed by M, and effectively is given a licence to kill. The ‘three-Bond-girl’ rule famously expounded by Roald Dahl when writing the screenplay for You Only Live Twice is more-or-less adhered to in Vollmer’s book; it does not take long before Peace is literally sleeping with the enemy. The plot itself, based around gold and nuclear weapons, has shades of Diamonds Are Forever, Goldfinger and Moonraker, and an underwater sequence featuring human torpedoes or chariots recalls Thunderball. But there are differences. Peace is far less deferential to the Vice Admiral than Bond is to M, and has no qualms about killing in cold blood. The surviving pages of Geoffrey Jenkins’ original Per Fine Ounce have not been incorporated into Peter Vollmer’s novel, but a few of Jenkins’ ideas for the novel are worked into the story. Jeremy Duns brought to light a letter from John Pearson to Jenkins which mentions gold bicycle chains and baobab wood coffins. The chains appear in the book as leashes around the necks of VanRyn’s pet hyenas (a Bondian idea lifted from Jenkins’ novel A Cleft of Stars), and baobab trees are frequently mentioned. In places Vollmer’s novel feels rushed. It lacks the depth that typify Fleming’s (and possibly Jenkins’) novels, the narrative being focused almost exclusively on the action, leaving little room in which to take breath and explore settings or characters. It took me a while to work out when the novel was set (would Peace have had use of a satellite phone in the early 1990s? ), and I was unclear quite how the gold, which gives the book its title, related to the nuclear weapons. There are also irritating errors, such as author referring to Lord Digby Brentwood as Lord Digby, rather than Lord Brentwood (although he is in good company; in the film of For Your Eyes Only, Tanner refers to Sir Timothy Havelock as Sir Havelock, rather than Sir Timothy). Overall, however, the book is an exciting page-turner, and gives us a flavour of what might have been had Jenkins’ novel been published. If you cannot wait until September 8th when Anthony Horowitz‘s James Bond novel is published, this continuation Bond-like novel nicely fills the gap. ← Anthony Horowitz to read Exclusive Extract from new Bond Novel! Sorry, I can’t agree with this. I thought it was an illiterate stinker without any redeeming features. Fleming and Jenkins were both fine writers, Vollmer isn’t remotely in their league and my copy was absolutely riddled with grammatical errors that just made the whole thing annoying. All opinions welcome here of course. Worth noting for readers that there is a 2nd edition that has cleared up the errors in the first one. It’s litlle abuse/easy to resume a novel to his grammatical ! Damn, why you so complain ? We understand that the author would say ans you have the chance that the novel is in your own langage. I’m a foreign, the novel is not translate, and for me all the words seems no correct in my own language. But I read it and I have appreciate the story ! I’m sure if I’d read it in French, all the grammatical errors would have passed me by. Unfortunately, I read it in my mother tongue and sorry, it’s a turkey! Is the second edition, the “corrected” one, available as a physical book? Given what I’ve heard about the first edition, I’d rather not take my chances despite my curiosity about this!